Timefactors G10/”NATO” Straps: Inquiry from the Mail Bag – I Already Have a Watch. I have previously read your article on the g10, naming your favorites. While the article is an outstanding reference ther is PERHAPS 1 mistake: from the pictures, I see that Time Factors does not sew their bands. So I called a friend who had tried numerous NATO/G10 bands & he tells me that his Time Factor band fell apart (in the field)after 5-6 months of use…EVEN THOUGH as you note: “the Timefactors design is actually among the truest to the actual DEF STAN spec” The lack of stitching would still make this an inferior band…vastly inferior. more inferior than a plated buckle alone I would love to have your comments. v/r K.
So if there has indeed been any mistake, it would have to be on the part of the Ministry of Defence who specified the welded construction in the first place. And in my mind, I don’t think there has been any mistake. 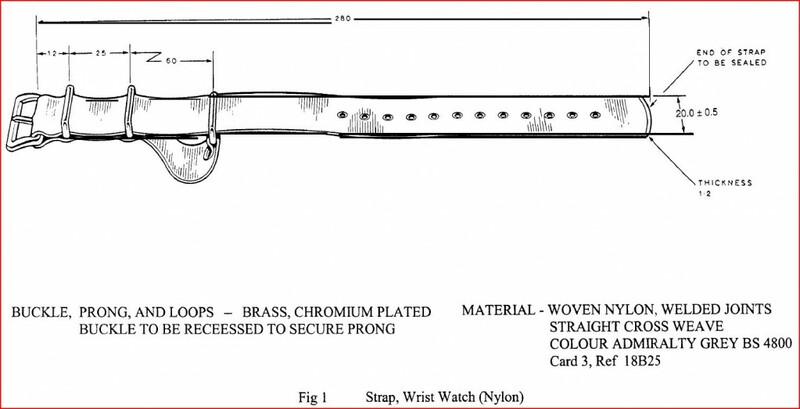 Modern heat annealing and welding techniques are capable of making a bond that is more than adequate for the loads placed on a wristwatch strap in most any imaginable application. I do not see how welded construction necessarily makes a strap “vastly inferior” at all and I think it a mistake to assume such. With specific regard to the problems your friend encountered with his Timefactors strap falling apart in the field, all I can say is that those results are in stark contrast to what I have experienced personally. I have found the materials, construction, fit and finish to be excellent. I have a Timefactors G10 strap that has by my reckoning about 7 months of wear on it since I’ve owned it, and it seems like it’s well prepared to continue and shows barely any signs of wear. My only persistent complaints about the Timefactors G10s are that I wish the “tail” was about 2cm longer to allow it to be tucked under the second keeper when worn on my wrist, and that I wish it were offered in a darker gray color closer to the issue “Admiralty Grey” color. However, neither of these is really an issue of quality, and as said before the Timefactors design is still among the truest adherents to the actual DEFSTAN spec. If you or your friend still would like a quality strap using stitched construction, I’d recommend again that you take a look at my other favorites the Maratac G10/NATO series straps as well. Both are excellent. I do mostly prefer the thinner fabric of the Timefactors for its more subtle presence on the wrist in casual wear, but there’s certainly nothing wrong at all with the Maratacs and they include the stitched construction you’re looking for. When I contacted Eddie at Timefactors about your query, he expressed his surprise that the strap might have failed in such a short time. Eddie also related that in many situations like this he might replace the strap in a one-for-one exchange so he could examine the strap to see why it failed and determine if changes to his design or production methods were necessary. I’d suggest you contact Eddie at Timefactors if you’d like to pursue that approach. Tagged with G10, maratac, NATO, Straps, timefactors.